Started in 1971 by Harish, Neeru and Avnish Kumar as a tailoring and embroidery shop – Neeru’s, currently is one of the biggest and most glamorous ethnic couture brand in the country with presence in 20 cities. Adding to this enormous base, Neeru’s has recently opened its first Pune store at Phoenix Marketcity in Viman Nagar and here’s how the summer-spring collection looks like. 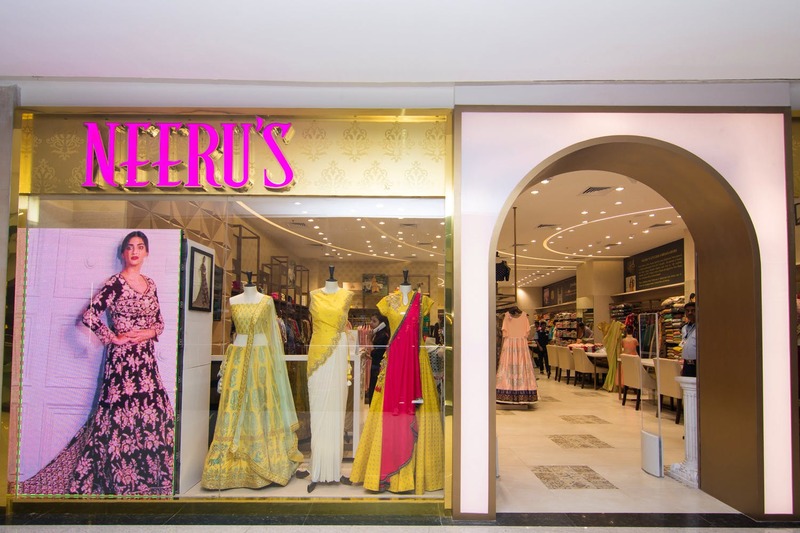 Located on level one at Phoenix Mall, Neeru’s is a breathtaking emporium bustling with bling, sizzling hues, pastels and flattering silhouettes. Presently, the store is all about summer and spring feels. Think soft butter silk, satin and macro velvet in mint, pista green, peach, corn yellow and subtle cornflower blue. The eclectic range of lehengas and wedding gowns is an absolute winner at Neeru’s. Priced between INR 7,000 and INR 1.2 lakhs, the lehengas adorn intricate floral embroidery, zari, crystal, pearl, Kashmiri sequin, Swarovski, handcrafted thread and kardana work. Besides royal lehengas, Neeru’s has a wide selection of sarees; from handmade kupwara to light-weight glass tissue fabric and easy-breezy crepe satins with quirky digital prints, this new range has something for everyone. We particularly loved the striking net sarees with elegant aari work, starting at INR 6,000 and raw silks in hot pink, tamarind and cherry red colours with resham broad borders, starting at INR 2,860. Another highlight of this store is their collection of wedding gowns. The best part, though, is that the collection caters to all body types. We found everything from ballgowns to A-line, mermaid, sheath, plunging V-neck, boat neck and more. Starting at INR 10,000, the colours that you need to check out this season are shimmery golden, platinum, emerald green, fuschia, rouge pink, ivory, eggshell and sky blue. Neeru’s isn’t only about heavy wedding attires. They have a beautiful collection of cotton kurtis, palazzo, tunics and skirts to go with your day-to-day looks.